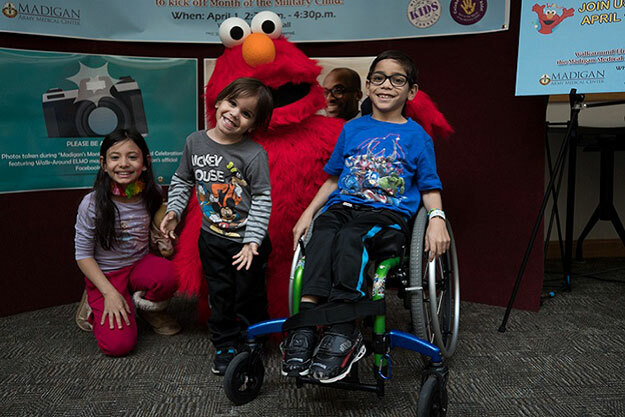 Madigan Army Medical Center kicked off the Month of the Military Child April 1 with a visit from Sesame Street's Walkaround Elmo. The beloved fuzzy, red puppet came to life to get out to meet and greet his fans. He charmed fans of all ages in the Medical Mall to celebrate the seven-year anniversary of Military Kids Connect, a website that features information and insight for military kids. Elmo spent a couple hours engaging and entertaining Madigan's families, including the Hendersons. Deja, 12, stood in line to meet Elmo with her brothers Junior, 8; Douglas, 7; and Malcomn, 4. They all grew up watching Sesame Street with their grandma. "She wanted us to learn; it was a fun way to learn," said Deja. In fact, Elmo began helping military kids and families with deployments and other military stressors in 2006, according to Dr. Kelly Blasko, a psychologist with Connected Health and the Defense Health Agency lead for the Sesame Street for Military Families program. Elmo's videos cover self-expression, changes such as new schools or new homes, and deployments. "Kids learn from Elmo, and parents see how to maybe parent better," said Blasko. "He's pretty loveable." Elmo came to Madigan in particular to help educate families about the relaunch of the Military Kids Connect website. Military Kids Connect is also on Facebook and Instagram. This interactive site is designed for military kids from ages 6 to 17, in particular middle and high school ages, to help with issues like moving and deployments, family, school, relationships, and how to connect for more information and support. Military kids are encouraged to connect with their peers via a message board to get advice on stressors unique to them; one of the most common issues discussed is military moves, said Blasko. "For middle school and high school, peers are really important, and they listen to each other and learn from each other," she said. "Early on, we really knew that military children have a community that's all around the world, so we wanted to have a place just for them to be able to talk about the things that are unique to them." The revised site goes beyond the traditional focus of psychological wellbeing to now include health and wellness as well. Other new features include blogs and video blogs, and a "Caring for our Youth" page with resources for adults who work with military children, such as parents, educators and providers. Military Kids Connect even includes a guide for kids on how to talk to trusted adults about any stressors they might be dealing with and how to make this scenario less overwhelming. Supporting military kids and the programs that help them is just why Madigan invited Elmo to visit. "Our military kids help serve, too, every time they move with their families to a new duty station or send their parents off to defend America overseas," said Joseph Jones, Madigan's patient communications and marketing officer. "We're proud to partner with Military Kids Connect, Sesame Street, and, of course, Elmo, to show Madigan's support for all of our military children throughout our Joint Base Lewis-McChord community.